formerly of 15 Green Curve, Banstead. Peter was born on the 22 September 1924 and he had two brothers, Martin and John. All three attended The Priory, a boys school at the western end of Banstead village. Peter was the 'good' boy in the family and always looked after his mischievous younger brother, Martin. He loved sport and could play a good game of tennis. 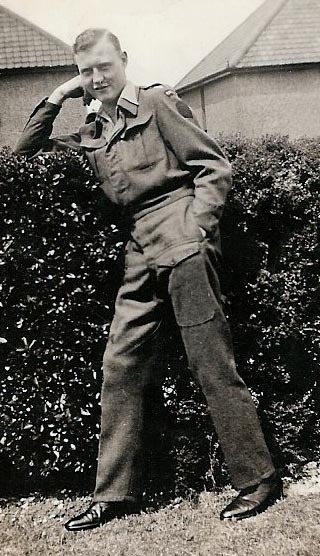 Peter attended Sutton County Grammar School between 1936 and 1940 and after leaving joined the RAF Voluntary Reserve. 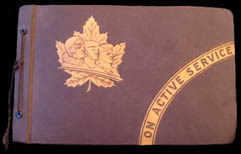 He spent part of 1942 and 43 training in Canada and during this period of time he took many photographs which he carefully kept in a special 'On Active Service' Canadian album. The pilot training was the longest and most difficult. From Initial Training School, recruits went to Elementary Flying Training School, where they got their first chance to fly. After his initial flying instruction, Peter first went solo in a Tiger Moth. Peter's album from his time training in Canada. 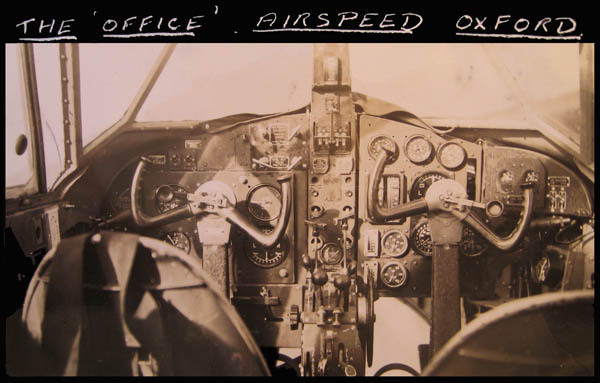 Further training followed at Service Flying Training Schools where Pilots were separated into fighter and bomber pilots. From there they went into Advanced Flying and Operational Training Units. Peter was destined to become a bomber pilot. 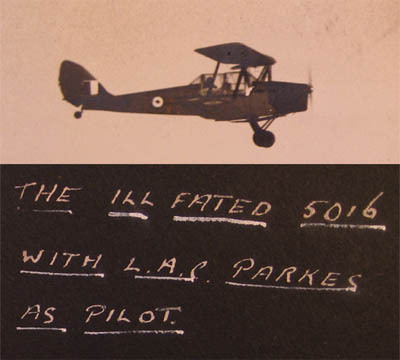 Another photo from Peter's album encapsulating his sense of humour in the handwritten title. 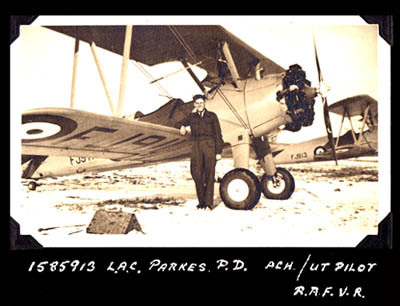 Following the end of his training in Canada, Peter went to RAF Lossiemouth in Scotland. 20 Operational Training Unit was formed in April 1940 when the Station was handed over to Bomber Command to be used mainly as a training unit for Bomber crews. 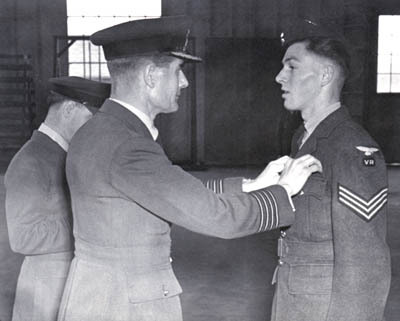 Peter's training completed, he joined 37 Squadron; initially, a daylight bomber squadron, heavy losses forced Bomber Command to change the unit to a night bomber squadron. At the end of December 1943, the Squadron moved to Tortorella, which was one of many airfields on the Foggia plain, adjacent to the Adriatic sea. The area had only recently been conquered by the Allies, who turned it into a base for their offensive towards the north of the Italy. The airstrip at Tortorella was as single-strip airfield running roughly north-south. It had been made out of well rolled local soft rock with pierced steel planking on top. This was raised up about nine inches above the ground to keep the whole thing above water in winter. The B-17 Fortresses of 99 BG were encamped on one side of the strip and the Wellingtons on the other. It was not a particularly peaceful place. USAAF ground crews began their daily inspections at about 0300 hours by starting up all four engines on every aircraft. Eventually, the aircrews came out and did the same and then they took off. By the time the Night bombers had landed and taxied in, it would be about midday and all would be quiet again. Then the Americans would land and taxi in. At about dusk 205 Group aircraft would warm up and take off and the whole cycle repeated itself again. All this in either of two extremes, a permanent dust haze or a boggy marsh which gave it it's local nickname of �Filthy Foggia�. During the early months of 1944, 37 Squadron was kept busy conducting bombing raids against the enemy, often in an attempt to distrupt supply lines to the front line. Often the targets were shipping or marshalling yards. In May, roads, railways, marshalling yards and docks were again to be targeted by the Squadron. The target on the night of the 5 May 1944 was a marshalling yard near Ploetsi. This area was a key source of fuel for the German war operations and had been targeted many times particularly by the USAAF which had already attacked the oil fields in huge numbers earlier in the day. In the evening Peter and his crew flew out on their next bombing mission. It is believed that they had engine problems with at least one catching fire, and after ditching their bomb load they attempted to make it back to base. They never returned. The plaque on the Memorial in Floriana, Malta. 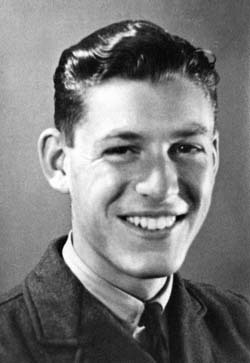 Peter had flown his last bombing mission in a Wellington X out of Tortorella, Italy. Initially he was reported as missing following a bombing raid, and writing to his old headmaster, Mrs D Parkes says that "waiting for news is almost unbearable". ...You will be sorry to hear that Peter was lost over the Adriatic on May 5th. I have lately heard from Air Vice-Marshall Baker, a distant cousin of the boys and he says we must give up all hope of Peter's return. They were already over the sea heading for Italy when they sent out their last message, saying that they hoped to get back on one engine. Had they been picked up by a German ship, which is most unlikely, we would have heard by now. Peter's commission as Pilot Officer was gazetted on March 28th, and dated back to January 14th. He was pilot of a Wellington. 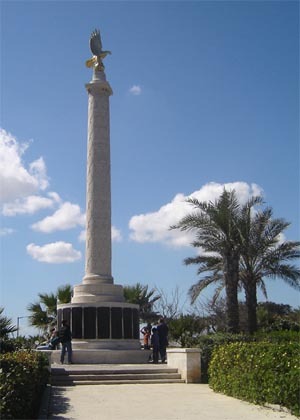 Quite some time later, the family received a letter from the Ministry advising them that the memorial in Malta had been constructed. It was to be many years later that Martin Parkes, Peter's brother, would visit Malta to see his brother's inscription on the memorial. 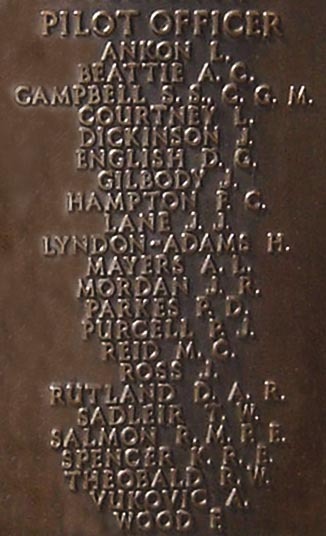 Peter is one of the Suttonians listed on the Roll of Honour which still hangs in the hall at Sutton Grammar School. Memorial Reference: Panel 13, Column 2. The Suttonian magazine and war letter archives from Sutton Grammer School. 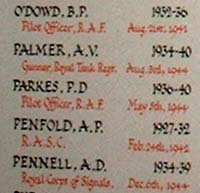 Memorial panel photograph supplied by the Shranz family, Malta. Photographs mainly come from Peter's own album now held by the family. Martin Parkes traced by Professional Genealogist and BHRG member Christine Kent. Last updated 13 July 2009 - Added more photos from Peter's album. Son of Albert Edward and Margaret Dorothy Peasley, of Banstead, Surrey. 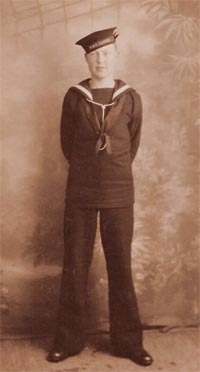 Edward joined the Navy at a very early age and had been to numerous places abroad. In May 1945 he was based at HMS COPRA in Genoa. This was an acronym for Combined Operations Pay, Ratings and Accounts. 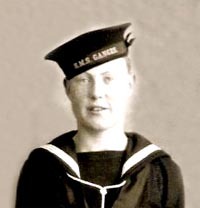 It was a shore based establishment set up to process the pay and allowances of Royal Navy personnel serving in Combined Operations in WWll. Edward lost his life after diving into the sea and hitting his head on submerged debris. It was only a few days before his 21st birthday. He kept two detailed diaries which were retained by his sister Grace who lives in Australia. They are now back in the UK and are held by his cousin's daughter, Jane Hill. Jane's mother who also lived in Woodmansterne and was the same age as Edward has fond memories of him. The picture (bottom right) shows Edward earlier in his career whilst training at HMS Ganges. HMS Ganges was a shore based training establishment at Shotley by Harwich Harbour where the River Stour meets the River Orwell, about eight miles from the county town of Ipswich. By the early 1940's, at about the time Edward was there, those under training numbered 2000; approximately 200 joining every five weeks. 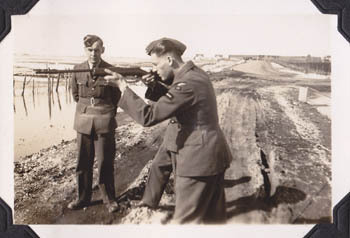 The boys' training at the time covered seamanship and signals training. Grave/Memorial Reference: I. C. 1. Son of George Henry and Florence Minnie Plowright, of 8, Glenfield Road, Banstead, Surrey. Grave Reference: 5. A. 5.